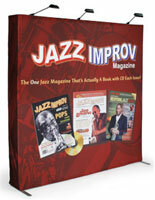 These 10' "pop up displays" can enhance your company's presence at your next event. 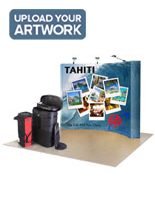 The "pop up displays", also known as exhibition booths, offer a great way to market your business at trade shows, conventions, and expos. 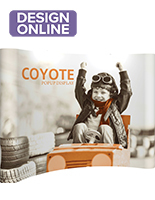 These pop up displays feature a straight, brushed aluminum frame that is lightweight, yet sturdy. 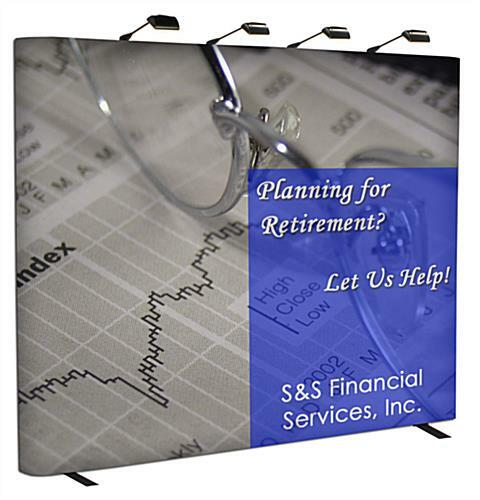 Custom graphics attach to the frame with hook and loop adhesives, while printed end caps offer a polished look. 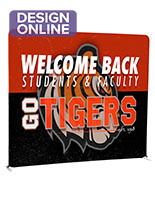 Your 140.5" x 88.25" wrap-around style graphics are printed onto a high quality knitted polyester with a 720dpi resolution. The fabric used is durable, flame retardant, and slightly stretchy to reduce wrinkles. 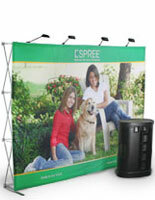 The entire portable display can be set up and taken down within minutes. 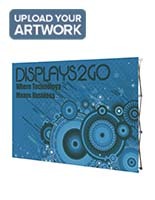 We also sell these pop up displays with four floodlights to accent your graphics. 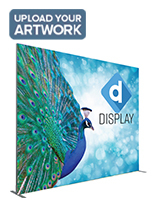 Designed with portability in mind, these pop up displays include a carrying case that makes traveling from show to show a breeze. The case is made of heavy-duty molded plastic and features roller wheels, dual handles, and locking security. There is even a foam-padded compartment at the top to store your lights. All of the pieces of the display easily fit inside of the case, however, the capacity is limited. You must remove the graphics from the frame, and place them atop the frame while packing the case. The pop up displays will not fit inside the travel case with the graphics attached. 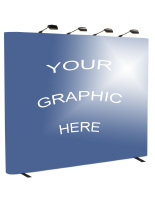 Detaching the graphics from the frame takes just a few minutes. Please Note: When repacking the unit for transport in the case, all components must be fully disassembled, and all hooks unclasped, to prevent breakage. 117.5" x 88.3" x 17.5"
I was very dissapointed in this pop up display. The frame is unstable, when you try to adjust the pegs to stabalize it and level it they break off or dont come down far enough because the frame is distorted. The metal hooks to not connect in all places and we had to prop items beneath it during our first use so it didn't tip over. We had the lights that accompanied this and they were HORRIBLE. They didn't attach to the frame properly, the instructions for attaching with them were terrible and they were top heavy so they kept falling off the frame. 2 of the three lights had attachment plastic pieces that broke off and we had to use SHIPPING TAPE TO GET THEM TO STAY ON THE FRAME! Very disappointed. The cloth backrop was great and it was easy to attach to the frame. We are sorry that you were unhappy with the quality of your order, Katie. Someone from our customer service department will contact you as soon as possible to address your issues. Katie, was your issue resolved? Posted one year ago by Tracy R.
I worked with Chahlynn on the order and creative for our display, and was very impressed with her responsiveness and positive attitude. We received the display on time, and were able to open up the box and set up the stand fully in less than 10 minutes - perfect for industry trade shows! 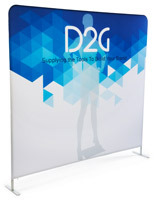 Very satisfied with our experience with Displays2Go - will definitely send our friends and clients to you guys for future work. Thank you!